Investigate a tragic house fire, and discover an insidious plot against the town. Find the burned down house. Learn about the house fire from a local guard, the jarl, or innkeeper. After learning about the fire, talk to the Jarl of Morthal. Visit the house and find a lead. Follow up on the lead and learn who set the fire. Visit the culprit's home and obtain evidence of a plot against the town. Report your findings to the jarl and be tasked with eliminating the threat. 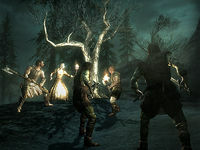 Lead a group of townspeople in the defense of Morthal. Just about everyone around town will be gossiping about Hroggar's house that recently burned down, with his wife and daughter inside. Since Hroggar shacked up with Alva the very next day, many townspeople suspect foul play. Once you've found the charred ruins of the house, next to Highmoon Hall, you can take your inquiry straight to the jarl, who will ask for your help in this matter: to sift through the ashes others are afraid to touch. Alternatively, after discovering the house, but before seeing the jarl, a guard will approach you, asking for help, and initiating the quest. Similarly, visiting Jonna at Moorside Inn before visiting the jarl will also set you on your way. In any case, another search of the burned house will rouse the ghost of Helgi, Hroggar's daughter. She describes dying in the fire. Even though she is a ghost, she is still a little girl. Agree to play hide-and-seek after dark with her, and in return she will reveal who set the fire. She also tells you that the game will begin at nighttime, so the other player in the game can join you. When you ask about this other player, Helgi becomes fearful, saying the other is close and may hear her. Then, precociously, she challenges you "If you can find me first, I can tell you", and promptly disappears. At this point, though it is not indicated with a quest marker, you have the option of going to the jarl to tell her you saw the ghost of Helgi. If you tell Jonna first about the spirit, she will direct you to the jarl to tell your tale. Speaking to the jarl will give you some insight into the game and direct you to the grave where Helgi was buried. You can also tell Hroggar that you saw Helgi's ghost and he will respond with chilling indifference. You will receive a quest marker indicating where to "find Helgi in the dark". Wait until nightfall to find Helgi "hiding" in her grave in a small plot behind the house. It's a short distance away, up and to the right, marked with cairns. When you arrive, Laelette is already there. Defeat Laelette and activate Helgi's spirit. She will be pleased that you won the game and found her before Laelette. She will then tell you the heart-wrenching story of how an unwilling Laelette was forced to burn the house. Laelette, in an effort to save the child, attempted to turn her into a vampire, but Helgi was too far gone from the fire and perished. She will then tell you that she is tired and wants to sleep. Meanwhile, Laelette's husband, Thonnir, arrives at Helgi's grave, distraught at finding Laelette dead. Speak to Thonnir and he will tell you that he thought Laelette had left him to join the resistance. Ask him if there was anything strange going on before she left and he tells you that his wife had begun spending a lot of time with Alva, and was supposed to have met her on the night she disappeared. Alva had claimed that Laelette never showed up. Here you inform the grieving husband your deductions about what really went on that night the women were to have met. Thonnir is incensed at the idea that Alva may be a vampire; he refuses to believe you and reiterates that you have no proof of Alva's undead status. A new quest directive invites you to investigate Alva. Break into Alva's house across town, where Hroggar is now living as well. Hroggar will be immediately hostile if he is in the house when you arrive. If you break in during the day, Hroggar will not be there, though Alva will be—sleeping in her coffin. If you break in at night, Alva will most likely be outside of the house, and the coffin will be empty but for her journal. Whichever time of day you break in, make your way into the basement to discover Alva's coffin and her journal. If Alva is in her coffin when you visit, you will need to deal with her, but her demise is not necessary to advance the quest. Read the journal to discover how all the events unfolded, including how she was turned by the master vampire Movarth, the plot to enslave the townspeople of Morthal for their blood, and the beginnings of your investigation. Take Alva's journal back to Highmoon Hall and the jarl will reward you with a small sum of leveled gold. She then asks one more favor: travel to Movarth's Lair and eliminate the threat. She has gathered a small group of townspeople, led by Thonnir, to travel with you. Thonnir, enraged by the events that took his wife's life, leads the charge whether you're ready or not. Once the party arrives at the lair, however, everyone but Thonnir flees in terror. Thonnir offers you a choice of whether he accompanies you or not. He's essential, so he won't die, but he can't hold his own well, and you don't require his assistance to advance the quest. Whatever you choose, enter the one-zone lair and dispatch the vampire thralls and Movarth. Movarth is a vampire boss that can regenerate health, and is generally pretty tough. If you didn't take care of Alva in her own house, she will be in the lair, and possibly aid you in killing the other vampires. You can then kill her yourself if you'd like, though this may result in a bounty if Thonnir sees you do it (this sometimes can occur even if he's outside). As you leave the lair, Helgi's ghost will appear and thank you for avenging her mother's death. Return to Morthal and the jarl will reward you with a leveled amount of gold and the jarl's increased disposition towards you. If you cast Clairvoyance before finding the girl's grave, it will prematurely lead you out of town to Movarth's Lair. Alva's journal will only appear after the objective to investigate her house is set. It won't be in her coffin unless you've talked to Thonnir about her. If you break into Alva's house during either night or day, right after taking her journal, you may see her rushing towards Movarth's Lair (usually she starts from the inn). Afterwards her dead body might be seen within the lair—she is killed by Movarth if the two meet. If Hroggar dies before the quest starts, the quest will proceed as normal. Thonnir, as a follower, will refuse to stop following you. His presence will also remove any bonus damage from sneak attacks if he can see you. Speaking to Thonnir after killing the vampire Laelette, but before examining Helgi's coffin, prevents you from doing so afterwards and prevents the ghost of Helgi from appearing. Seemingly though, the quest can still be completed once all other stages are done, and you will still receive your reward from the jarl. Laelette can be found before dusk, where she would normally spawn, above the burnt house. She is invisible, but not hostile, and you can speak to her. She doesn't have anything interesting to say. In very rare cases, when playing "hide and seek" with Helgi, you may not fight Laelette because she will be killed by unknown causes. This does not stop or hinder the quest though. When playing "hide and seek" with Helgi, Laelette may not be at the coffin. When activating Helgi's coffin, you will still hear her say "Make Laelette go away" though. Laelette can be found on the cliffside just above the coffin, completely unresponsive and temporarily invulnerable. She may also be wandering Morthal, and hostile. Alva may occasionally be hostile for no reason and wandering Morthal. Killing her doesn't seem to affect the quest. ? Alva's cellar may be glitched. On the right side, after going through the door, there is a hole where the barrels are. A bucket will repeatedly fall and respawn. Hroggar may not be hostile when you enter Alva's house at night. However, if you talk to him, he will still yell about how he won't let you hurt Alva. If you ignore the mob and go to the cave without talking to anyone they will still follow you there. If you enter the cave and clear it without help, the mob will be waiting outside after Movarth is killed. You won't be able to talk to Thonnir. The game may move the entire mob to Fort Greymoor upon quest completion. If you sneak attack Movarth with a bow, he may run and eventually get stuck in a wall where you cannot hit him. Leaving and reentering the dungeon will reset him to his initial position in his chair. Note that if this happens, it's a good opportunity to kill everyone besides Movarth without his interference. ? You might find Alva fighting another vampire in the cave. Afterwards she will stand still and talk like you would normally find her. There is a bug that prevents Movarth's Lair from becoming cleared. Idgrod may not engage in dialogue with you. Clear any delivery mission listed here first, then return to the jarl. After killing Alva while she is in her cellar, Hroggar might still be hostile upon entering the house at night. He will also talk like he's still a thrall if you talk to him outside. If you encounter Alva in the main area of the house as she is returning home or leaving, she may not be hostile, but will still shout that she is going to kill you. 20 A mysterious fire killed Hroggar's wife and child. Hroggar took Alva as a lover immediately after the fire, and many in the town think he did it. The Jarl might pay me to investigate it. 30 Morthal's Jarl has asked me to investigate the house fire that killed Hroggar's wife and child. Hroggar took Alva as a lover immediately after the fire, and many in the town think he did it. 70 Morthal's Jarl has asked me to investigate the death of Hroggar's wife and child. Hroggar took Alva as a lover immediately afterward. I suspect she may be a vampire, but I need proof for the Jarl. 95 Morthal's Jarl has asked me to investigate the house fire that killed Hroggar's wife and child. The vampire Alva enslaved Hroggar and had his family killed in a house fire. Alva's master in Movarth's Lair plans to enslave the entire town. 100 Morthal's Jarl asked me to investigate the house fire that killed Hroggar's wife and child. The vampire Alva enslaved Hroggar and had his family killed in a house fire. Alva's master in Movarth's Lair plans to enslave the entire town. The Jarl now wants me to destroy Movarth and put an end to his plot. 200 Finishes quest Morthal's Jarl asked me to investigate the house fire that killed Hroggar's wife and child. The vampire Alva enslaved Hroggar and had his family killed in a house fire. Alva's master in Movarth's Lair planned to enslave the entire town. The following empty quest stages were omitted from the table: 1, 5, 6, 7, 9, 10, 25, 80, 90, 97, 110, 130. On the PC, it is possible to use the console to advance through the quest by entering setstage MS14 stage, where stage is the number of the stage you wish to complete. It is not possible to un-complete (i.e. go back) quest stages, but it is possible to clear all stages of the quest using resetquest MS14. This page was last modified on 5 April 2019, at 03:03.